Over time CMS headquarters was transferred to St Louis, Missouri. It was in St Louis that our biggest challenge occurred, in 1993. 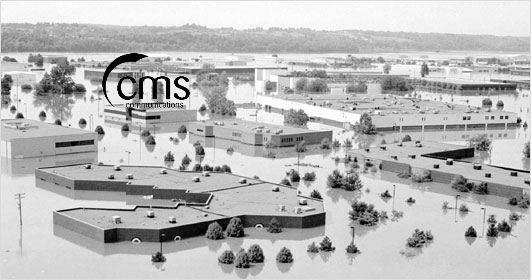 The “flood of the century” which hit the Midwest that year, flooded our warehouse and corporate offices with over 10 feet of water. Fortunately for us, we are a telecom company, and had a new location rented with a working phone system up within 24 hours. CMS still has many employees on staff from our early days. One of our proudest achievements is the length of time employees spend with us. Our employees are dedicated to provide the best service and experience in the industry. We hope to have you join the CMS family! CMS was started in a garage in 1985. Glenn Cosman, Tom Murphy and Mike Statter (CMS) decided to go into business together selling refurbished Rolm telephone systems. Initially CMS was located in Southern California. However as we grew, locations were added across the country. CMS expanded from just a few employees to over 100 employees in several years, and was even listed on Fortune Magazine’s list of fastest growing companies.